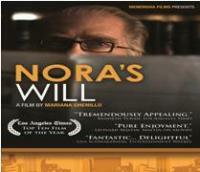 Nora’s Will is a comedy like nothing you’ve seen before. It’s a truly unique tale of lost faith and eternal love from one of Mexico’s most talented new filmmakers, writer/director Mariana Chenillo. When his ex-wife Nora dies right before Passover, José (Fernando Lujan) is forced to stay with her body until she can be properly put to rest. He soon realizes he is part of Nora’s plan to bring her family back together for one last Passover feast, leading José to re-examine their relationship and rediscover their undying love for each other.